GOLD PRICE rose only a token dollar to $1,138.10. Great day for the SILVER PRICE though. It leapt up another 44.5 cents (2.9%) to $15.702. This is leaping tall resistance with a single bound. The GOLD PRICE first. 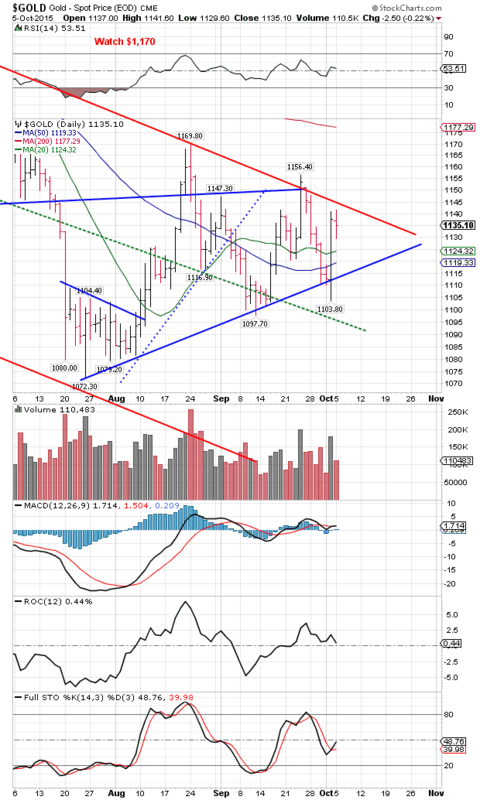 The gold price neared that downtrend line from the January high, and blinked. Here’s the end of day chart, but remember that shows a lower close today than Comex. This looks like somebody who has bounced off a door backing up to take another run at breaking it down. The SILVER PRICE pole-vaulted from $15.25 Friday over resistance at $15.25 and $15.50 up to the next bar at $15.72. This is beautiful, and looks like third wave enthusiasm. 200 day moving average stands only 26c above at $15.96. Should silver cross above that 200 DMA, every trader and his cat will begin paying attention. I am a little bit concerned because that GOLD/SILVER RATIO has really stretched out to the downside. Friday it gapped down jumping over its closely spaced 20 and 50 DMAs and cutting into the 200 DMA, although it did not close below the 200. Today it collapsed on the End of Day chart, ending at 72.6 with the 200 at 73.83. Look at the chart. 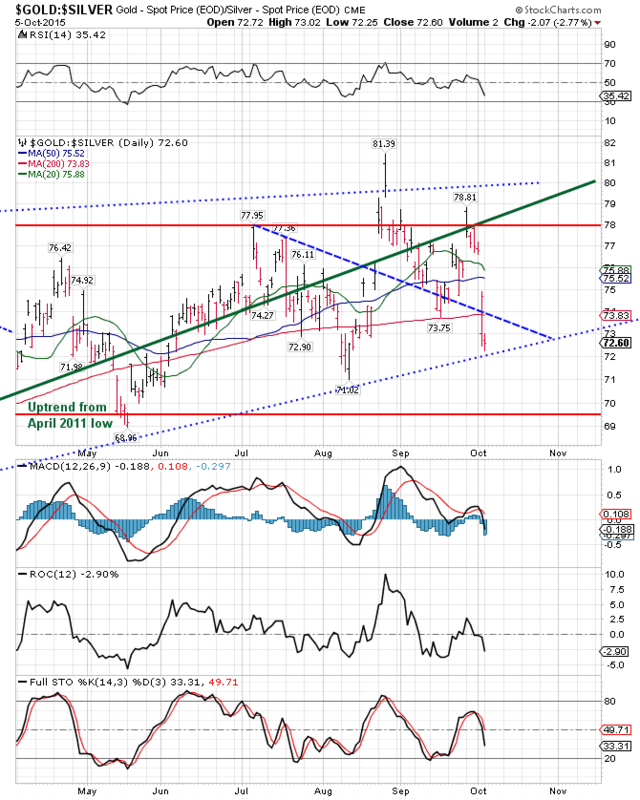 That dotted blue line marks the uptrend from the July 2014 low, and that’s where the ratio stopped today. It’s already below the uptrend from the April 2011 low. If it breaks down any further, any lower close tomorrow, then big things are fixing to happen for the silver and gold price. On the other hand, it might mark the limit of a move. Here, look for yourself on the left. Durned if I know which, but that ain’t no surprise! After all, I ain’t no more’n a nat’ral born durned fool from Tennessee anyhow. If Wall Street and the whole durned worl’ collapses, I ain’t worried. I’ll just buy me a tin bill and peck in the dirt with the chickens. Trying to parse out why the US stock market should rise on the worst imaginable employment report, I have read several articles and I agree with a theory that sounds too crazy even for today’s world: investors are reasoning that with the economy sooooo bad, the Fed (1) can’t raise interest rates and thus tank stocks, and (2) must sooner or later crank up Quantitative Easing 4. In other words, Wall Street LOVES a rotten economy because it means the Fed will keep subsidizing them. This thought has run my Stupid-O-Meter over into the red and broken it. Worse yet, I believe it’s likely accurate. I also believe it won’t last. Stocks gapped a tiny gap up today and the Dow but not the S&P500 nicked into the 50 Day moving average (moving averages are in bearish alignment with the 20 below the 30 which is below the 200). That 50 DMA will likely contain any further rise, but what if it doesn’t? It climbs 150 more points to the last high? What has changed in the economy? Sure the Fed can create more money, and more and more until they hyperinflate, I reckon, but I remember the 1919-1923 German hyperinflation where the stock market made enormous gains — but all an illusion. In purchasing power terms it lost. Stocks may spend a few more days consolidating, but the trend is DOWN, and the trend is your friend. Never bet against your friend. Dow rose 304.06 (1.85) to 16,776.43, while the S&P500 rose 1.83% (35.69) to 1,987.05. Clearly the market is offering stock investors one last chance to sell out. Take it. As it has been doing the last couple of days, the US dollar index rose with stocks, today up 27 basis points (0.28%) to 96.24. This solves nothing, answers nothing. The 30 DMA is above the 20 DMA and that’s above the 200 DMA, and they are rapidly intertwining, very close to each other, not a situation likely to last for the duration. Dollar index closed plumb on the 50 DMA, which for the last 5 weeks hath contained it. Dollar index turns leaden and gravity-bound with a close below 95.50. Japanese yen threatened to break upside out of a triangle but was quickly slapped back today, down 0.45% to 83.03. Euro made a lackluster pitty-pat move at breaking out Friday, but didn’t amount to a hill of beans. Fell today 0.18% to $1.1190. Pitiful. And you call yourself a world-class currency?